Shown here: bluxome/eastA layer 14, October 5, 2008; piece by CHEZ. Right next to Apex’s new piece is another huge, intensely detailed burner by CHEZ. Once again I was lucky enough to capture several stages of the work in progress to share with you here. Chez’s way of working with color here is something I haven’t seen before: overlaying a white-on-black backlayer with transparent colors for the fill. Check it out! 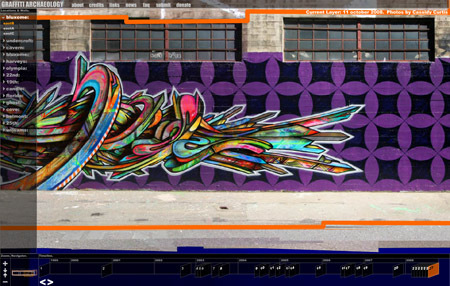 Apex has just finished an incredibly ambitious piece in the center of the Bluxome wall back here in San Francisco. 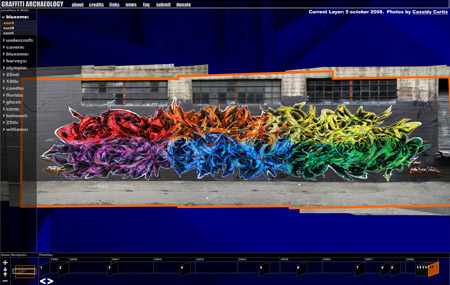 It’s a third of a block long, and he used over five hundred different colors of paint to create it. It took him almost three months to finish, so I was able to catch several stages of the work in progress. I particularly enjoyed seeing the layering of color on color for the fill, and how he used the blank parts of the wall as a sketchbook for trying out different ideas. Check it out. See if we've answered your Frequently Asked Questions. Powered by WordPress with theme based on jd-nebula design by John Doe.